Planning for Carnage has been under way since early this past summer. With less than a month to go before the convention kicks off, things are starting to feel truly real. This year feels different to me, for several different reasons. To start, it’s Carnage’s 20th anniversary. The convention was first held in 1998 in a small hotel ballroom in Lebanon, New Hampshire. Since then, it’s grown to the point of taking over entire resorts. I’ve been attending the convention since 2005, so I have quite a few under my belt, but there are still plenty of people attending this year who can proudly say they have been to every single Carnage. Last year, the convention offered an online registration option for the first time, letting people skip printing out and mailing in a paper form. This year, Carnage took the next step forward, using an online, real-time registration system custom built for game conventions called Tabletop.Events. Having a dynamic system that facilitates customer self-service — people can see what games are open while lounging in their PJs, instead of having to pad down to the convention information desk! — has been huge for both the attendees and the organizers. Adding games to the schedule after the initial launch no longer means they’re on an addendum sheet that not everyone may catch. In fact, the automation of registration has given me the mental bandwidth to work on something I’ve wanted to do for a while: work on more graphical elements for social media, like the one above. They may not go viral, per se, but I’ve seen the metrics on the few that have published so far and their visibility has been significantly better than text-only posts, or links to the Carnage website. Plus, getting continuous seat time in Photoshop has been a help for me finally getting more comfortable in that space and learning what the tools really do as I’m following along with tutorials to achieve this effect or the other. Graphics for social media are a low stakes area for Carnage, so there’s room to play and get creative to see what sticks. Lastly, but by no means least, for the first time ever Carnage will host live comedy games of Dungeons & Dragons featuring not one, but two groups. Friday night, Improvised Weapons is an actual play podcast featuring improv comedians from the Burlington area that I’ve been enjoying for a while now, and this will be their first live show with an audience. Saturday night, Victory Condition Gaming hosts the next installment on their ongoing live stream game run by Joe from Gemhammer & Sons with a cast of characters from the regional convention circuit. And yes, you read that right, it’s a live stream game, available through Victory Condition’s YouTube channel. Victory Condition is also kindly providing live stream coverage of the Improvised Weapons shows and other games at Carnage this year. This past weekend, I spent some time weeding my game library. One of the treasures I stumbled across was this pair of cards from Munchkin Carnage, a fan-made version of Munchkin made by longtime friend of Carnage, Tom Mechler, which he ran at Carnage on the Mountain in 2013, the convention’s first year at the Killington ski resort. The hook was that players would encounter convention staff and other Carnage references as monsters, treasures and so forth in the course of the game. 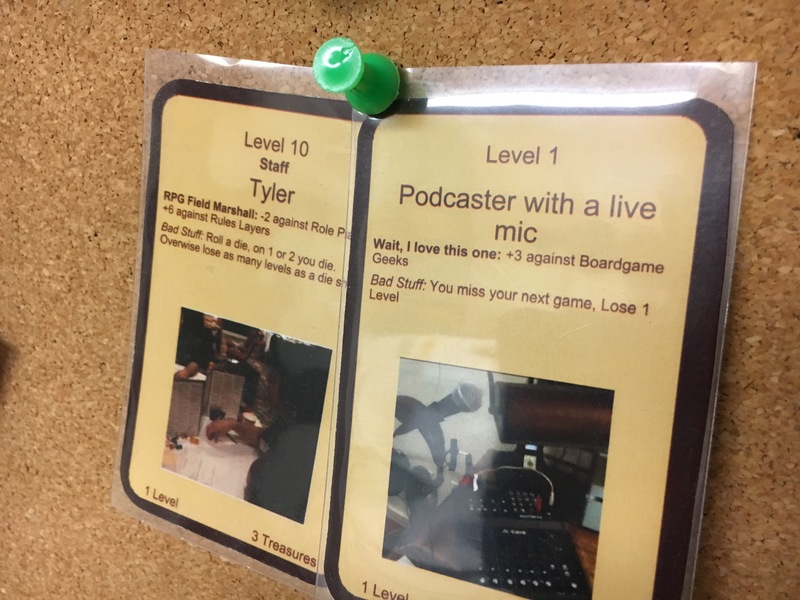 In my case, I got recognition as an role-playing game field marshal for Carnage — though I’m pretty sure that photo is of me running a Hellboy scenario at Northeast Wars — and as the producer of Carnagecast. In retrospect, making Podcaster with a live mic a level one monster is rather poetic. Carnagecast never got the traction and audience engagement that I hoped for. It was a great learning experience, though, especially with learning to recognize your audience’s behaviors and interests. 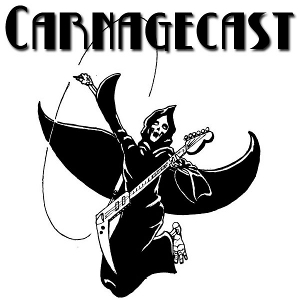 After a nice post-convention rest, we are back with a new episode of Carnagecast, talking about how A Fistful of Carnage went. Ray and I spent most of our weekends in the Snowshed, so we have the inside skinny on role-playing games and card games. The new Dungeons & Dragons edition turned out to be the most demanded game in the role-playing hall, which says a lot for the name’s ability to outlast nerd rage. It’s a nice little conversation, and I’m glad to be back in the swing of recording episodes. Listen in! Stetsons Are Cool was Robin Lea‘s Doctor Who-based adventure, in which we Time Agents tracked down a highly dangerous zygma beam device in ancient American west. I may have gone a little goofier with team leader Kip Brannigan than was appropriate, but I think he and medic Hanso had a good back and forth repartee going. Call of Cthulhu: The Card Game was a nice mid-slot game to play while working the information desk with Rod. He’s picked up the core set and Sleeper Below, so he played cultists and Cthulhu against the Syndicate’s tricks, and then Yog-Sothoth’s discard effects. The Great Snowball Battle is a cute card game of little kids slinging snowballs at each other until everyone gets called inside for losing their hats, boots and gloves. Ticket to Ride‘s Switzerland map is annoying. Sentinels of the Multiverse was played with another old hand and two newcomers who originally thought we would play Citadels because I mumble; one of them dug it and the other one I probably ought to have handed a deck other than Bunker’s. Gygax Magazine Pub Quiz, Saturday night in the bar, was a hoot. Our chief heckler of the last two years became the fill-in host, so the tables turned in a way. Next year, though, I look forward to James and Mary slipping back into the hosting duties. The Game with No Name math trade netted me some great stuff, too. I turned HERO books, Gamma World and Revolution! into Netrunner cards — hello, Grimoire playset! — and a classic copy of Wiz-War, which I’ve wanted to try more of. Plus, after the trade concluded, I got to help a lady rebuild part of her Cheapass Games collection, after a tragic loss to fire. So this year’s trade was a win on multiple levels. Our second year at Killington was good. We had a better idea of what to expect and how to do things. There were unanticipated questions, of course, with the resort and our attendees, but nothing outside the usual stretch. In the end, we had a great convention, and folks had fun. Mission accomplished! Ray flies solo in Carnagecast this week as Andrew Valkauskas, designer of the Fate of the Norns: Ragnarok talks about his new card game Gulveig, what Carnage-goers can look forward to at the convention next month and plans for Fate of the Norns as a tabletop game property in 2015. Maybe I shouldn’t break the fourth wall on this, but I don’t think it’s going to surprise anyone to learn that I ran the board on this episode. I made an inadvertent tribute to one of my favorite comedy personalities, Paul F. Tompkins, by blurt laughing off-mic when I was supposedly absent from the recording. We struggled with Skype on this as Andrew gamely kept shuffling his desktop arrangement to eliminate the issue, but I hope you’ll stick through the rocky audio. This week on Carnagecast, we talked with Al Spader from Jetpack Comics about Dungeons & Dragons 5th edition, Wizards of the Coast’s new Adventurers League organized play structure and what Dungeons & Dragons-related fun folks can expect at A Fistful of Carnage in Killington this November. Probably my favorite part of this episode was sitting more fully in the producer/engineer’s seat, which is my wheelhouse by trade and inclination. Ray leading the interview gave me the opportunity to focus more on making sure everyone sounded good. Sometimes this makes me feel hyper-critical, as I want to re-take every statement covered up by incidental noise, but having the freedom to watch the audio levels and listen for quality without also tracking the conversation and moving it forward was a rare treat for me, and greatly enjoyed. Our run-up to A Fistful of Carnage, Vermont’s tabletop game convention the first weekend in November on the slopes of Killington Peak, continues with a new episode of Carnagecast. We talk about the newly unveiled schedule of games, our first trips to Carnage and agree that, on reflection, taurine is not a meal. The preparation for Carnage and professional commitments keeps me busy these days. After the convention, my plan is for the podcast will return to an every other Monday schedule. We’re on the final leg of 2014, but like winter, Carnage is always coming. It’s important to pace oneself through the winter and spring months in keeping the Carnage flame alive. Amid all the hubbub of the Carnage book posting on Monday, I didn’t get the chance to relay some other doings. Carnagecast posted a new episode as well: Shuffle Up and Deal. Ray and I talk about card games, mostly. Ray’s a Magic man for a long time running. I got out at Homelands, because it was just that terrible, by all accounts. He informs me on the Elder Dragon / Commander format, and I carefully pick the moments where I ask him to expand on something. I get to talk about as openly about Call of Cthulhu: The Card Game as I’ve ever gotten to without feeling the burning pity of someone who likes something else better. And you know, after we recorded this episode, I did teach Ray Call of Cthulhu, and sent him on his way with Romance of the Nine Empires. I got to see the truly glory of the explorer Roald Ellsworth, bouncing in and out of play with Ultima Thule. Ray found that one. It was pretty cool to see in action. Carnage posted their convention booklet yesterday afternoon. The convention’s just over a month away, taking place at the Killington mountain resort in Killington, Vermont. We’ve got an astonishing number of role-playing games this year. Pathfinder Society remains a powerhouse. Dungeons & Dragons 5th Edition has its Adventurer’s League getting into gear. We’ve got more cool game designers than I can fairly mention in this space, awesome GMs who have devised adventures in the games they love and a schedule full of all the other tabletop games you might want to enjoy in a single weekend. The only thing missing is some Call of Cthulhu: The Card Game. I’ll have my decks, so come find me this year for a round!